- Pattern of trying to discredit competition continues! 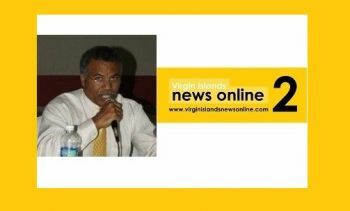 ROAD TOWN, Tortola, VI- Virgin Islands News Online has found it necessary to respond to a very misleading article, which appeared on one of the pro-government online news sites on October 4, 2012 under the headline "Breaking News: Dr. O'Neal Wins Libel Case Against VINO; Damages To Be Awarded Soon". We were not surprised to have received many phone calls from some of our over eight thousands readers per day, advertisers and supporters in regard to the deliberately erroneous article by our main competitor BVI Platinum News, which was posted today October 4, 2012, on their false and politically motivated claim that Dr. Hubert O’Neal had won a libel case against Virgin Islands News Online. Firstly, no libel case was brought against Virgin Islands News Online. 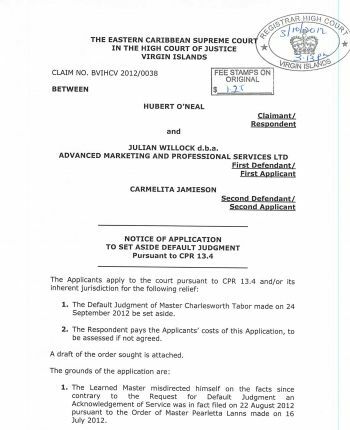 There was a case brought against Advance Marketing and Professional Services, to which the name of our former Director, the esteemed Julian Willock, whose name still appears on our trade license, was later added as the first defendant. 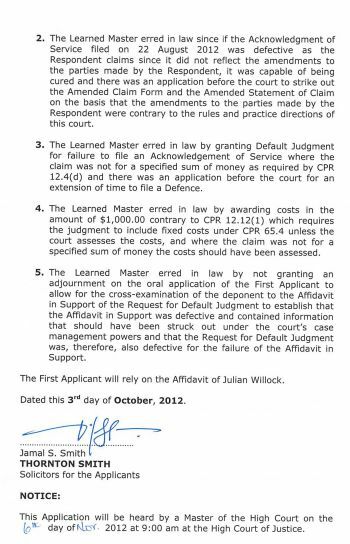 Furthermore, BVI Platinum News’ headline in their article is grossly misleading, as on September 24, 2012 Master Charlesworth Tabor sided on a Default Judgement, which means that the case never even went to trial. This means Advance Marketing and Professional Service and Virgin Islands News Online, which wrote the article, never had an opportunity to prove the facts of the case in a court of law. A Default Judgement is a judgement in favor of either party based on some failure to take action by the other party. Most often, it is a judgement in favor of a plaintiff when the defendant has not responded to a request of the court in a timely manner without due and good reason. The failure to take action is the default, not that Dr. O’Neal won his case in a court of law or that the story written by the news site was libelous. In fact, most legal experts that looked at the case had already concluded that Dr. O’Neal could not have won in court since what the news site reported was already public information filed at the High Court Registry, therefore it could not have been considered libel. A Default Judgement can therefore be compared to a forfeit victory in sports. 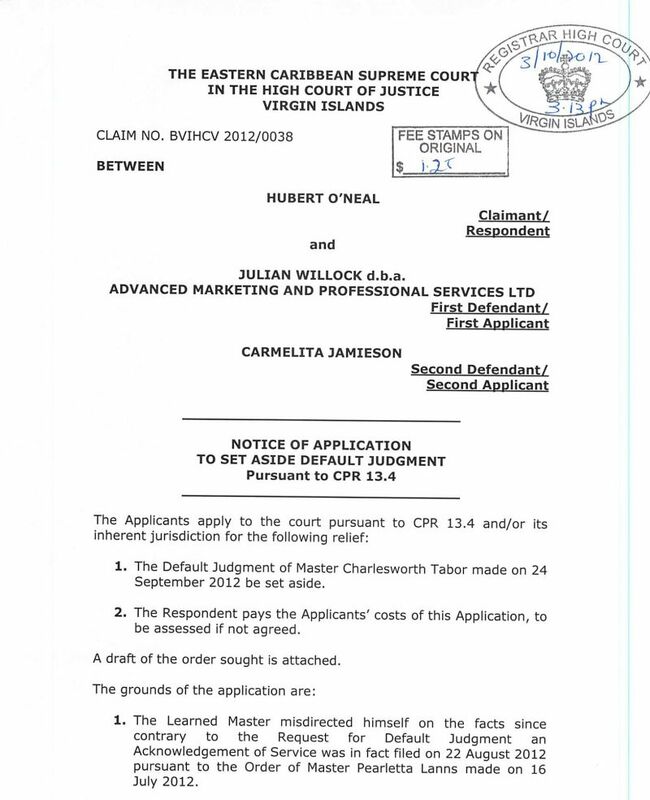 However, Advance Marketing and Professional Services was dealing with the matter and had retained counsel from overseas; however, when Mr. Willock’s name was added to the case as the first defendant he took over the case from the parent company Advance Marketing and Professional Services and he requested more time to obtain his own legal counsel. He then retained the law firm of Thornton Smith to deal with the matter. 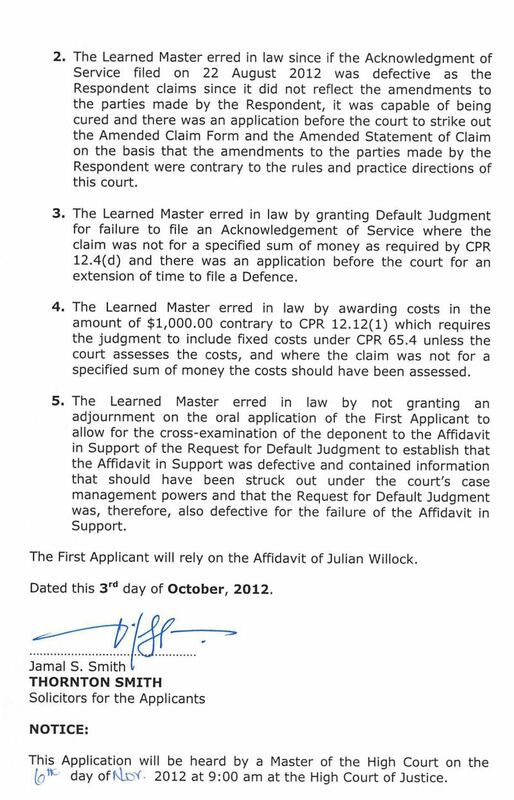 We are pleased to announce that the law firm has since filed in the High court, asking for the Master’s Default Judgement to be set aside based on an error of law made by Master Tabor. We are confident that the judge will rule in our favor and if the case had gone to trial we would have prevailed based on the facts of what we reported. We can say nothing further, as we will not try this matter in the press because of our high regard for the Courts. Virgin Islands News Online stands by its original story that we reported since it was based on facts about Robinson O’Neal Enterprises and Cassandra Titley O’Neal Phd., who is the administrator of her late father, Amos Jerome O'Neal’s estate. This news site is never in the habit of pursuing any personal attack and agenda against anyone, unlike two other media houses - one online news site and a tabloid newspaper. With well over two and a half years of operation, Virgin Islands News Online has already established itself as solid, creditable, accurate, objective and not linked to any political party or family. That is why we are free to be objective and report only the truth, unlike others who can never say that. That is why people trust this news site exclusively within government and all over to call us daily with inside information and tips on injustice and unfair practices. This, we might add, is the basis of professional journalism and what all reporters in the Virgin Islands should aspire to achieve. We say again to those in the media houses, who continue to delight in the many failed attempts to be critical of Virgin Islands News Online, we humbly and politely suggest that one attack against the media house is an attack against all. Today it may be this news site, tomorrow it may be yours. We continue to thank our many readers, advertisers and our team of reporters around the Virgin Islands and the Caribbean and also our other media partners locally for the support, wise counsel and commitment to free speech, facts, and objectivity. Virgin Islands News Online will be here for a long, long time as we are not going anywhere anytime soon. Please click link to see story that was the subject of the libel suit by Dr. Hubert O’Neal. BAM let them tek that VINO you have finally break the news the real deal good job..let me see if the other sites will post this? VINO, most of the media houses are against you...they are still after you guys...dem always trying to say that your articles are inaccurate when they know that is not so! Take that! Vino kick the facts. I must say vino going to keep beating the competation. This lie that platinum reported could have been avoided, if Platinum was not so bias and political and pro NDP yea and arrogant and pompous too…VINO we will always support you. And VINO isn't pompous? Esteemed.... Indeed! Oh Maaan!!! When funny man see the facts he goin $h1t himself and will have to close down platinum... Poor fellow he cannot stop VINO! If only he can see the errors of his wicked ways and do the work the people elect him to do we could consider supporting him! I read the O'neal article and it was not libelous. But VINO should have defended the case but its not over yet!! Boy, JW you got them again just how you want them so NO, when it rains it DEOS NOT pours!! Why are you all surprised? The other site is know for biased reporting! I swear that Platunim and Beacon report more about their opinions rather than the actual facts about a story! Ha ha let Hubert tek dat for trying to say vino article prevented him from beating uncle ralph? We done know doc cannot beat uncle ralph as long as ralph steering the ship in the 9th and that is a fact!!! Mr. Willock, the intensity of the positive support in these comments about you and VINO is welcoming news. How can an ordinary young man who minds his own business be so liked? When you have done good like you have, you will always be loved by all, well not all i forgot the view haters ...just do not let it go to your head! “That is why people trust this news site exclusively within government and all over to call us daily with inside information and tips on injustice and unfair practices”…I not a fan of VINO, but I must agreed 100 % with this statement!. the good thing about you J is you born here! While others could run and hide in Antigua or St. Vincent for 20 years, you cannot go anywhere that is why we love and will always support you brother! This situation is a keen example of why it is very neccessary to have more than one news reporting medium. As an unbias reader, I read all sites to pick out the truths from the half truths and by the time I get through reading all the sites, I can then pick sense out of nonsense and gather what really is the truth. I am not condoning this kind of reporting, but that's just the way news reporting hasdeveloped throughout the world. For years, the other sites controlled the news monopoly and reported in a very bias fashion. Now that there's a site with a different view or angle, it appears that it's under attack. VINO keep bringing us the news. I am one who welcomes ALL news sites! VINO it seems like they are even plagiarize your blogs. I wrote a blog on your site then I looked on Platinum an saw the same blog but in a negative fashion. Desperate men do desperate things how sad...VINO all the way! I am not surprised by the Beacon or Platinum. They have used those two media on several occasions to attack persons they do not like and divide the BVI by race, where you from and what party you support. Unfortunately many of us cannot afford to pursue legal actions, as some of us are not born here so we leave it alone. But one day both Beacon and Platinum will touch the right person and they will get what they are looking for!!!!!! I think people should boycott those two media in protest of the despicable way they do the news and the division they cause to the BVI a peaceful place…and I know enough people are smart enough to see the hidden agenda of those two media. That means they are not posting people's comments once it’s positive...the real example of bias and example of a media site with its own agenda. Not to worry Platinum, NDP, and the other racist paper think we are idiots? This Battle of the BVI news site is just so childish and distasteful. Keep it about the issues that matter the most please. But I read the story from vino and where is the libel?? ?